A complex man with simple pleasures, high standards and soulful values. Wine has always been a part of Ben's life. A native San Franciscan of Italian descent, Ben grew up with wine as part of every family meal and gathering. His grandpa made his own red wine blend in the basement, where Ben listened and learned. Ben's heritage and love for wine always beckoned. The passion caught fire in his early twenties as he explored wines from around the world—Bordeaux and an occasional high-end California Cabernet. But the wines that really turned Ben’s head were Burgundies from 1956 and '57. During his 37-year career with the San Francisco Newspaper Agency, Ben met future partner Bruce Perry. Through their common passions—cooking and wine—they became fast friends. They joined together to make wine as a hobby in their garages. They made and experimented with many varietals, but both found Pinot Noir to be their true passion. Seduced by those captivating aromas and elegant nuances, Ben and Bruce volunteered to work during harvest at a friend's Sonoma County winery specializing in Pinot Noir. There they honed their craft and never looked back. Today, the Papapietro Perry cellar is simply a more elaborate version of Ben’s garage where he started making wine more than 35 years ago. "Authentic, not pretentious," says Ben. "Confident, but not too serious. Humble. The winery is an extension of my home and personal hospitality." Maybe that is why one corner of the cellar is a kitchen where family favorites are prepared for the staff, and the occasional lucky friend who drops by at lunchtime. In Ben's words, "cooking and wine are indistinguishable." He simply cannot imagine one without the other. When Ben isn't in the cellar or the kitchen, he and his wife Yolanda like to travel and pour Papapietro Perry wines wherever they land. 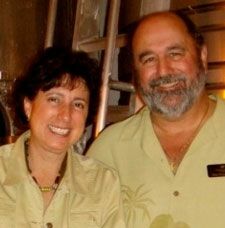 Yolanda joined the family business in 2009 handling distributor relations and enjoys pouring with Ben at events. When they're not traveling, Ben and Yolanda enjoy spending time with their two grandsons.